Lions, giraffes, and zebras...OH MY! This colorful and cute safari cake is the perfect addition to a jungle baby shower - and to the baby nursery! 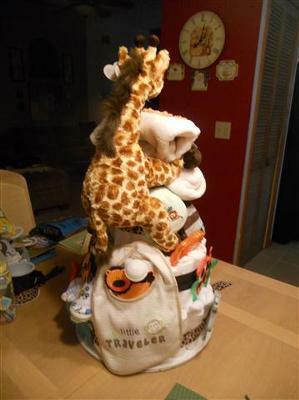 Jean submitted her wonderful diaper cake to our gallery to share her sweet safari ideas. 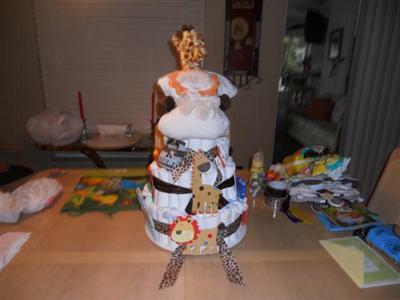 She also submitted her recipe and directions for her cute cake...we're so glad she did! We LOVE posting cakes and baby shower ideas from our readers because they are the true inspiration for this website! We hope you like Jean's cake too! The Mom's nursery theme is done in animal prints and animals found on safari, such as giraffes, lions, zebras and elephants and monkeys. I used 110 Pamper Swaddler Diapers (size 8 to 14 lbs.). The main tier base has two bottles of baby lotion and the second tier has one bottle of baby wash. 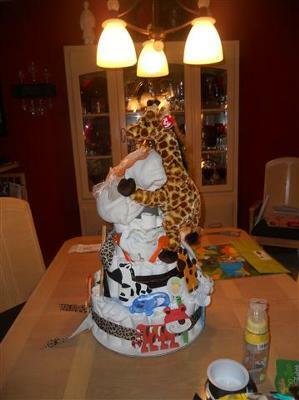 I then placed onesies, bibs, socks, pacifiers, spoons and forks onto the cake. The Mom loved it so much that she placed it in the nursery as received to go along with her decor.